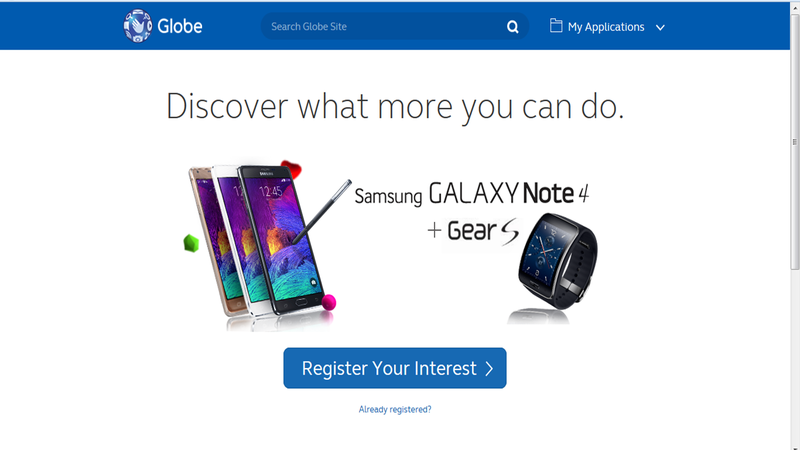 The Philippines is excited to welcome the newest Samsung Galaxy Note 4 and Galaxy Gear S. In line with this, Globe Telecom has launched online portal to serve early customers. It accepts registration of interest among customers who wish to purchase the latest devices with a postpaid plan from Globe. It is available on the Globe website via https://samsungnote4.globe.com.ph, the registration of interest portal allows new and existing postpaid customers to choose their device color in advance and register their personal details such as name, mobile number, and e-mail address. The customer database will be used to update registered customers with postpaid plan offers and pricing details. A reference number will be provided to customers so they can track status of their application. The Samsung Galaxy Note 4 has a 5.7-inch Quad HD Super AMOLED display, a 2.7GHz Quad-Core processor, Android 4.4, 3.7MP front-facing F1.9 lens camera, 16MP Smart OIS back camera, Advanced S Pen, and 3GB RAM + 32GB Internal memory which supports microSD up to 64GB. Meanwhile, the Samsung Galaxy Gear S has a 2.0” Curved Super AMOLED display, Dual core 1.0 GHz, 512MB RAM memory and 4GB Internal Memory storage.